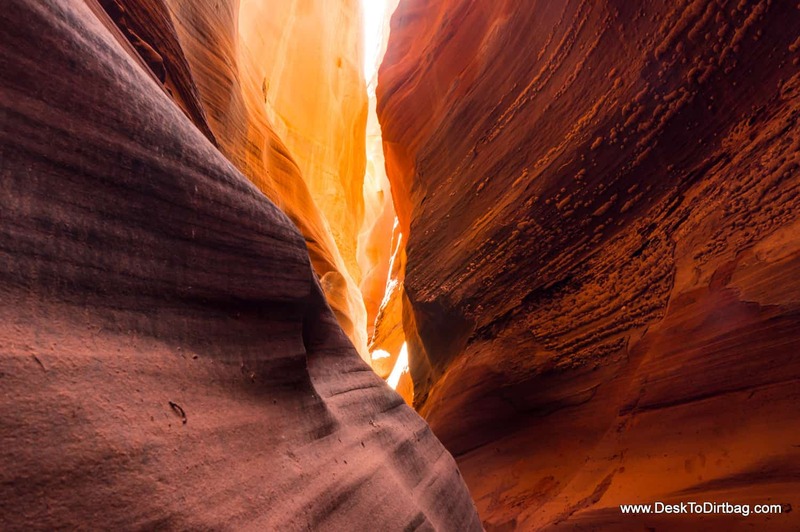 Brimstone Gulch, a slot canyon in Grand Staircase Escalanate, Utah. I spent a day exploring the narrow slot canyons of Spooky, Brimstone, and Peek-A-Boo Gulch. Hiking in canyon country was something totally new to me at the time. It felt quite a bit unnerving to me being unable to see readily identifiable landmarks on the horizon like I am used to. On more than one occasion I felt unsure of where I was going. In fact, I stumbled into Brimstone Gulch first only by accident. An interesting experience making your way through the narrow canyons which aren’t even wide enough in some places to walk through normally–you have to squeeze through shoulder first. Shot on my Sony NEX-6. Also see my backpacking trip through nearby Coyote Gulch.